Sok-sok áldással és örömmel teljes volt a 18-35 év közötti fiatalokkal a miskolci experimentum 2017. július 14-től 20-ig, majd július 20-tól 23-ig prágai finálé, ahová közösen utaztunk Miskolcról, hogy találkozzunk a többi experimentum résztvevőivel. 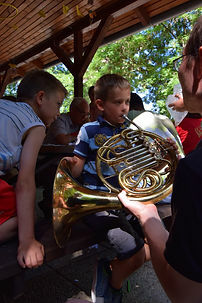 Az angol nyelvű leírás itt olvasható: https://www.magis2017.org/art-and-culture "Accompanied by music"
On the third day we thought it is time to support the other Magis experiment in Miskolc, the Playing together group. So we went to the playground in a poor neighborhood area for playing and singing there with the children. They could even try out our instruments. As every night we closed the day with the Taizé prayer where a few visitors from the city joined us. During the examen and the Magis circle we could feel that we are getting closer to each other and to the Lord from day by day, and grow in the Holy Spirit. After the usual morning prayer and meditation we visited the castle of Diósgyőr where we sang in the chapel, and we were also asked to sing for a tourist group. It was fantastic to pray in a place which has been serving God since the middle ages. Afterwards we went to the downtown to advertise Taizé prayer we have every evening in the local parish church. 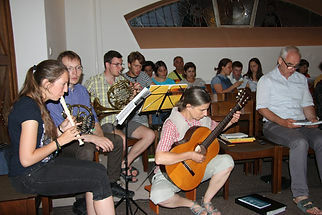 It was a very interesting way of evangelizing, we enjoyed playing like street musicians. Tonight we also celebrated the birthday of two participants from the experiment. The first day started with a beautiful morning prayer and then we played some ice breaking games than our real experiment started. We also had our first morning together. After lunch we had a song practice. In the evening we held a prayer in the local church. We organised a small birthday party for one of the participants. We closed the day with an examen and we formed the Magis circles.